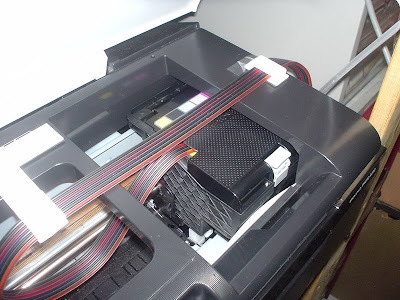 Several sites and youtube videos already showed how to install the continuous ink supply system (CISS) on to the Epson R290 printer. All of them require that the ink cover be permanently removed to allow for the tubings to be installed. That's exactly what I originally did but not without problems. The CISS that I bought uses soft plastic for the ink catridges thus when placed into the ink compartment, it doesn't fit tightly causing the the electrical contacts to be intermittently broken. When this happens, the printer driver will complain saying that the ink is not Epson original thus refusing to allow any printing. In the beginning, I placed some wood wedge to force the cartridges to snug-fit.